The best online furniture stores can't do what in person shopping does. Thank you for your interest in Fireside Furniture! We do not sell our product over the internet or via mail order nor will we quote prices over the phone or online. There are several reasons for this policy. Furniture must be seen in person to really understand what you are getting. To appreciate the quality of the wood, finish, materials and construction in the furniture you must see, touch and try it which even the best online furniture stores can’t offer. Second, any savings that you gain by buying direct would be lost because of the high costs of shipping furniture. Fireside Furniture purchases in large freight amounts and therefore receive much better rates than the consumer can ever get with one order at a time. Once purchased our delivery specialists will deliver, place and assemble your furniture as part of our reasonable pricing. And there’s just plain trying the furniture out to feel if a sofa fits you or the the dining room chairs are comfortable. Last and most importantly, is service. Somehow, someway, sometimes, there may be something just not right with your furniture when it is delivered. It could be the factory’s fault, the freight company’s fault or the delivery people’s fault. It doesn’t matter, it just needs to be fixed. If you bought from Fireside Furniture, the answer is simple, it is the Fireside Furniture’s responsibility to make it right. You may think you are saving money on the internet, but your long term real costs will be higher. 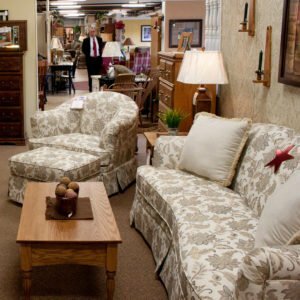 Fireside Furniture would love to help you in person before, during and after the sale. Thank you for your interest and we hope you will enjoy your new furniture.